The ambitious plan, driven jointly by UTL and Vodafone, was to introduce automation that would significantly reduce costs, improve service levels and shrink the footprint of the entire picking and packing operation within the warehouse. James Hodgetts was the programme manager working on behalf of UTL on this major project, he comments, “My brief was to select a partner who could help us to develop a completely bespoke solution to automate around 80% of the volume of single item orders which were all previously processed by hand. “We shortlisted two companies for the project, Axiom and one other. The contract was awarded to Axiom as they demonstrated a superior knowledge and expertise of automated systems. They’re a forward thinking company and of the people we spoke to they were right out in front in terms of new technology. “The Axiom team was especially knowledgeable regarding how the new process line would interface with the UTL systems – this was a real plus point in their favour. We knew we wanted a totally unique solution and Axiom gave us a feeling of confidence that they knew exactly what they were doing and how they were going to deliver the end result we were looking for. At the start of the twin level automated process, UTL’s warehouse control system allocates a job to the line via the Axiom system. The serial number and product code is scanned for each product either by hand or automatically. A small order profile typically includes a phone, a SIM card, printed documentation and occasionally the addition of an accessory. As the product begins its journey down the twin level line it reaches the three SIM hoppers and if the particular device requires one, a SIM card is fed out from the appropriate hopper. It is validated by camera and incorrect cards are automatically rejected and corrected. The SIM is then automatically positioned onto the lower conveyor directly underneath the product. Two printers match the dispatch note and any accompanying documentation to each order. The paperwork is scanned to check for correctness and the documents are fed from the printers on top of the SIM card on the lower conveyor under the relevant phone on the top level. 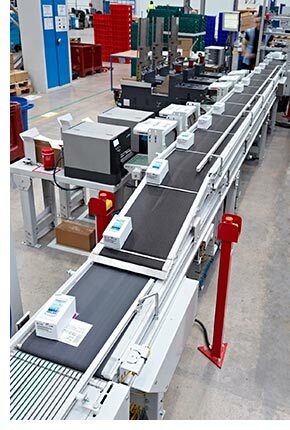 Products and documentation then converge onto a single line and the variable speed conveyor controls input to the automated bagging machine. As the product is fed into the bagging machine it is checked for length to determine the size of bag required. Each order is individually polywrapped, a printer inside the bagging machine produces an address label and adheres it to the outside of the bag. It is scanned to check it is the correct label and that it has been applied correctly. Then the bag is heat-sealed and any waste plastic collected for recycling. As the finished bag exits the machine it is scanned again to check its final destination. There are four pushers which automatically sort the products down chutes into large boxes according to delivery type. 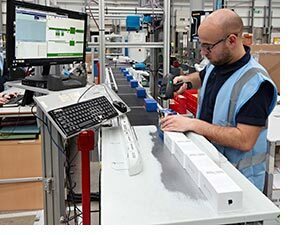 Each item is tracked individually all the way down the line ensuring that the data is intact and absolutely correct from start to finish when the product is shipped and billing information triggered. “It has been easy working with the Axiom team,” concludes Hodgetts. “It is a family owned business so you are in contact with the directors; there’s no lengthy chain of command to slow things down. Decisions are therefore made swiftly and work gets done at a faster rate. “We have taken out a support contract with Axiom too, so that we can use their 24/7 call out facility; usually, however, any issues can be solved remotely. As we expected, Axiom’s automated line has proved to be robust, reliable and simple to run. The operator screens are really intuitive – they give a visual representation of the line so any problem can be pinpointed immediately.